Just as a home is more than a house, cohousing homes are more than condominiums. To the people who create them, cohousing is an active and involved community of neighbors who know and care about each other. Despite a wide variety in location and appearance, cohousing communities have certain features in common. Their size is generally between 20 and 40 units – small by conventional developer-driven standards. With its large club house (or “common house”) , pool, gardens, workshops, and open green spaces, there are many amenities for a small number of households. Cohousing communities are designed by the residents to meet their own needs for community and privacy. This generally results in some similar features, such as keeping cars on the periphery, with buildings grouped together to leave green space open for all to enjoy. Cohousing is carefully designed to create a socially rich and interconnected community, a true “neighborhood” in the old-fashioned sense of the word. Residents do not have a shared economy or a common set of beliefs or religion. Although individual homes have all the traditional amenities including private kitchens, residents may share meals in the common house several times a week. A core value of cohousing communities is environmental sustainability. This is reflected in how the land is graded and open space preserved, in using high quality green building materials and techniques, minimizing the intrusion of cars, and more. The sense of community created in these neighborhoods is the secret ingredient of sustainability, enabling people to teach each other to be good stewards of the land. “Eyes on the Street” are the best security system you can have – just ask any police officer. Living in a community where everyone is a familiar face provides enhanced safety. Children can run and play freely and knock on their playmates doors. Emergency calls to cohousing communities are dramatically lower than calls to conventional homes. Financing is often undertaken by the future residents, who act as “owner-developers” and provide the capital to fund the design and planning costs and the property purchase. The project is built by means of a bank construction loan, which is paid off as individual residents obtain mortgages for their homes. Although turnover in cohousing tends to be quite low, owners may sell their units under the same legal guidelines as any other condominium. However, most communities offer considerable help in this effort by recruiting potential new members and maintaining waiting lists on an ongoing basis. The community does not have veto power over transactions but seeks to orient potential new residents to the cohousing lifestyle. The Sacramento region is home to eight cohousing communities – six of them completed, two underway. The first cohousing community in the United States was Muir Commons, built in Davis 25 years ago. Soon after that, Southside Park Cohousing was begun in a sketchy downtown Sacramento neighborhood (that it quickly helped turn around). 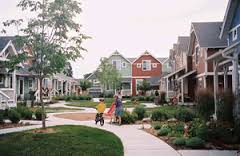 Also in Davis is N Street Cohousing – a retrofit style in which neighbors turned their suburban block into a cohousing community. Glacier Circle is a small senior community in Davis. Going “up the hill” you will find Nevada City Cohousing, a thriving intergenerational community, and Wolf Creek Lodge, senior cohousing in Grass Valley. The first suburban location in Sacramento County will be Fair Oaks EcoHousing, an intergenerational community which recently received a rare endorsement by the Environmental Council of Sacramento (ECOS). Fair Oaks EcoHousing plans to break ground in Spring 2017. Renaissance Village Homes, a new community in development, has recently optioned land in West Sacramento at 4th & G Streets. Both communities are welcoming new members. For information on new local communities, including dates for free site tours, visit www.FairOaksEcoHousing.org or www.RenaissanceVillageHomes.org. To learn more about cohousing on a national level, visit www.cohousing.org. Many cohousing communities have been guided by the architectural firm, McCamant & Durrett, and the consulting firm CoHousing Solutions, both located in Nevada City. Their principals, Katherine McCamant and Charles Durrett, authored the basic texts Creating Cohousing: Building Sustainable Communities and The Senior Cohousing Handbook. This article is informational only and is not intended to be an endorsement, recommendation, or legal advice, and should not be taken as such.